A small haven of peace, this architect-designed villa is in a peaceful, quaint neighbourhood. The villa has declining levels, a garage, a view of the mirror pool from bedroom 4, and the terrace seating area from three bedrooms, with sea views throughout the house. The large kitchen / living room, with a bar, extends onto the covered terrace. Each of the four bedrooms has a private bathroom with a hand basin, a shower, and a toilet. There is also a bathtub in bathroom 4. Each bedroom has a small terrace. There is a boules court behind the house. La Madrague is a very quaint district with authentic fishermen's huts. It is very quiet and peaceful with starting points for hikes, the coastal path, the dune path, and the vineyard trail. The private garage can accommodate 1-2 cars depending on their size. There are sun loungers around the pool, couches and armchairs on the terrace. We were 3 couples who stayed for 1 week. House was very clean and entirely renovated. Although bedrooms are relatively small all of them include a full bath and therefore provided us with all the intimacy that we needed. Beds are extremely comfortable. As per the common areas, they are large and roomy. The outside terrace can comfortably sit 8 people and the kitchen counter is extremely practical when temperature is too cold for al fresco dining. The kitchen is extremely well equipped and has all the necessary appliances. An outside BBQ is very easy to use and we did on 2 occasions. We hired bikes for the week and they were worth it as within less than 30 minutes and you are surrounded by more than 20 wineries. The views are beautiful and location of the villa is within a 5 minute walk from the water and restaurants. To all future renters, there is a walk called Le Liroral between the house and Bandol that takes you along the coast...fabulous! You can depart on foot directly from the house. We all had a magnificent time and would recommend strongly. Traumhafte Aussicht auf das Meer und La Ciotat, inkl. toller Sonnenuntergänge. Die Wohnung hält, was die Website verspricht! Jedes Zimmer mit eigenem Bad, das war super für unsere drei fast erwachsenen Kinder. Unbeschränktes wifi, cool. Wir würden das Haus jederzeit wieder buchen. Merci Thérès! 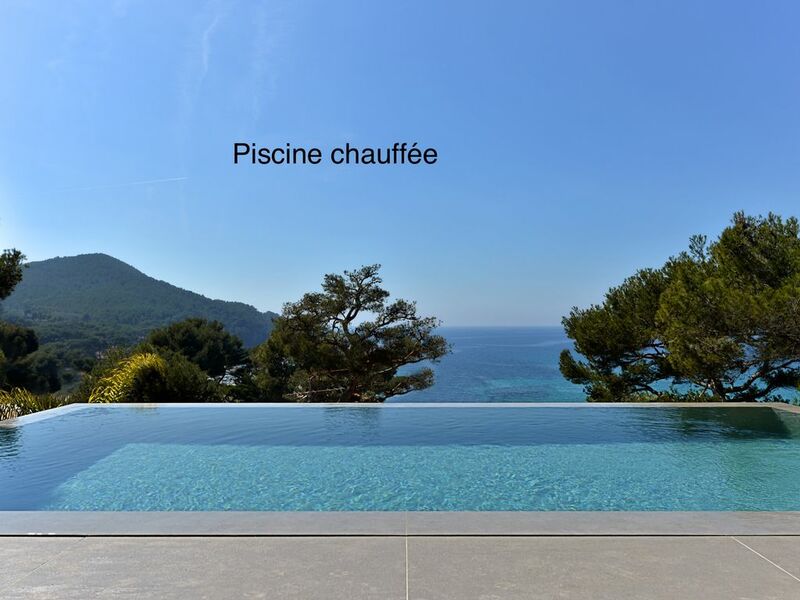 Résidence très agréable à vivre avec belle piscine miroir et splendide vue mer. Plage, port et petits commerces accessibles à pied, très pratique avec des ados qui sont ainsi indépendants. Propriétaire très accueillante et aux petits soins pour les locataires. Moderne Villa mit durchdachter Architektur (drei Schlafzimmer mit Eisuite-Bad/WC, das vierte hat eine integrierte Dusche), großzügigem und pflegeleichten Wohn-/Essbereich und moderner Küche, große Terrasse mit wirklich traumhaftem Meerblick, ausreichend großer Pool eine Treppe tiefer (die Treppe ist abschließbar, was für Familien mit kleinen Kindern hilfreich ist), sehr große Garage, Grillbereich mit Weber-Grill hinter dem Haus, nur wenige Schritte bis zum Meer sowie zur Marina mit Restaurants und einem kleinen Lebensmittelladen, sehr hilfsbereite und freundliche Eigentümerin. Wir haben uns dort zwei Wochen lang sehr wohl gefühlt. Une vue à couper le souffle! Nous avons passé une très bonne semaine dans cette maison très confortable bénéficiant d'une vue imprenable sur la baie. Nous avons également apprécié les conseils de notre hôte sur les visites à faire pour découvrir cette belle région. Maison de vacances très agréable. La vue depuis le salon, la grande terrasse, la piscine et l'une des chambres est magnifique. La rue est très calme et la plage accessible à pied. La cuisine est très bien équipée. La propriétaire est très sympathique et donne de bons conseils de balades.